A Crystal Creature is an offspring of the Gem-Bodied Creatures that Wario faces during the events of Wario World. They resemble smaller versions of Gem-Bodied Creatures, but with a distinct face. 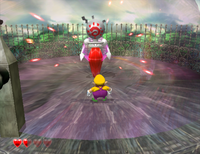 The main enemy will summon two to five of these enemies to attack Wario. Fortunately, Wario can use these to damage the Gem-Bodied Creature, which is immune to his punches. Red Crystal Creatures wield a sword that can slice Wario. Yellow ones spin in a circle towards him. Blue Crystal Creatures stab repeatedly in front of them, hoping to skewer Wario. Flying Crystal Creatures of any color simply dive-bomb him. The ground-bound Crystal Creatures block all frontal attacks, so it's easier to stun the flying ones. When the main enemy is defeated, all undefeated Crystal Creatures disappear. This page was last edited on January 24, 2019, at 12:47.